My daughter Elyse and her husband Paul went fishing on Lake Michigan for Paul’s birthday. Charter boat for 5 hours with a no catch / no pay policy. It was a Friday morning in mid September and they ended up trolling within the McKinley Marina breakwater as it was too rough to go out farther. They ende dup with 5 salmon, 2 at 17 lbs. The Boat crew said that this time of year the salmon are better smoked than fresh. So that is where I come in. 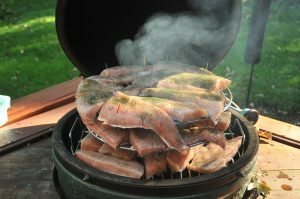 I have smoke salmon and carp a few times with great success. When I came home from work there was 25 lbs of skin on filets left for me to prepare. First we took about 5-6 lbs and made gravlax. 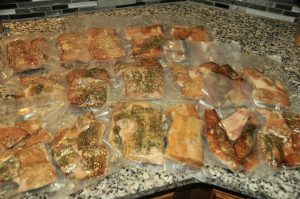 1.5 c salt, 1 c sugar, 3TB dried dill rubbed on the filets and then they were wrapped and pressed in the fridge for 36 hours. Pin bones were pulled with a serrated pliers. Shallow jelly roll pan on the bottom to contain the juice. After 12-24 hours drain the excess liquid. Prior to vacuum packing and freezing to -10F to kill any parasites. Early samples are great tasting , although I am not fond of the slime. Next time we will scale or skin first. For the smoked fish we used 1.5c salt, 3c brown sugar and 4 TB dill . Coat the filets liberally and layer in a large bowl. Fattest / belly meat on the bottom. These went in the fridge Rotate the filets after 18-24 hours. Leave the juice. Best if the fillets are sliced lengthwise along the lateral line and then across about 3/4 the way through into 2-3 ” wide chunks. Morning of smoking, take the filets out and rinse liberally in cold water. Then soak in several changes of water for another hour. This prevents the surface from being overly salty or sweet. For smoking, let them air dry for 1-2 hours to form a pellicle on the surface. I also added more dill and black pepper. Then place in the smoker. I used a Big Green Egg with 3 level cooking grate. Put the thinnest on the bottom and thickest on the top rick. I had to use toothpicks to keep the fillets from sliding off. Next time I will use uncolored toothpicks, the colors of the party toothpicks migrated into the meat and looks wierd. Smoke with cherry wood chunks at 185 for 5 hours. This is where the heatermeter really pays off, holding this low temp accurately for hours on end. FInal meat temp was 150. However it hits this at about 2 hours in and then you get the “stall” as the moisture evaporates and the meat temp really does not rise for the next few hours. 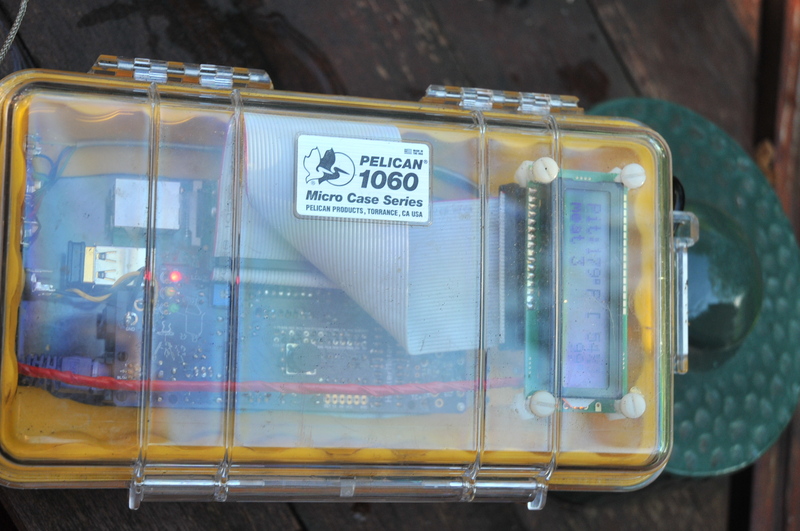 So don’t get alarmed that the fish comes up to final temp “too early”. Take the pieces off (yes it can be a struggle if you forget to oil the racks). Cool and then pull of the skin and scrape the grey meat along the lateral line off (so called mud line) to get rid of the bad flavor of that region. 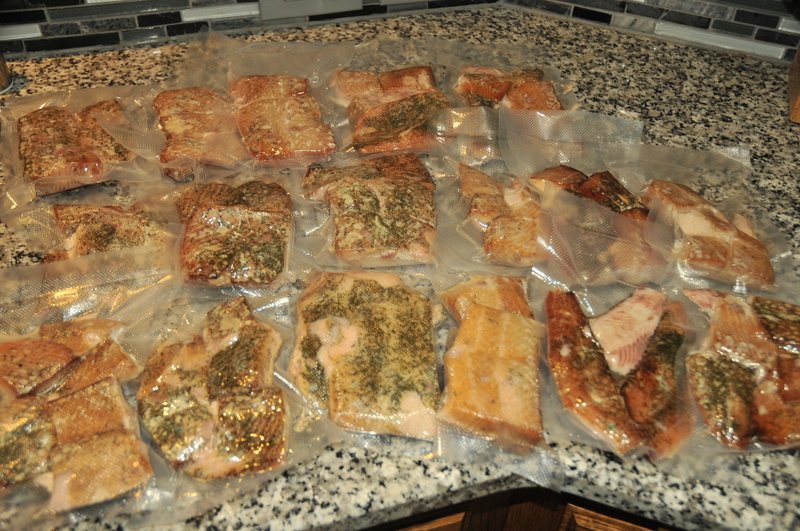 These were then vacuum bagged and frozen. From a food safety these are just fine as is (aside from watching your mercury intake thanks to the coal fired power plants). We ended up with just under 9 lbs of finished product. Fillets loaded and ready to go. Note the order of loading needs to be reversed with thick belly filets on top and tails on the bottom . Toothpicks keep the fillets from sliding off. 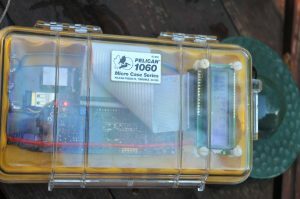 Heatermeter in its water resistant case , This is a great project in and of itself and saves a lot of worry on long or low temp smoking sessions. In the winter being able to pull up the current stats on you computer is a big plus.